Welcome to Austerlitz German Shepherd Dogs! We are a small hobby breeder of German Shepherd Dogs located in Sand Springs, Oklahoma, approximately 30 miles west of midtown Tulsa. Our dogs are exclusively from German bloodlines and are bred to the exacting German (FCI) breed standard. We uphold only the highest standards in the health, temperament and structure of our dogs, as well as in their care. We are experienced trainers as well as breeders, and we are proud to show our own home-bred dogs in conformation, IPO, herding, agility and obedience events. We are breeders of high in trial competitors in IPO, agility and obedience, and numerous regional winners in conformation. 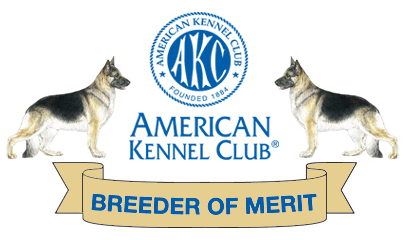 AKC Breeder of Merit since 2011.